Arent they a couple of cuties? These figures come packed in the same small box, accompained by a trading card which features both of the young Qiaos. They are posed in the same way as their original CG artwork from this game. 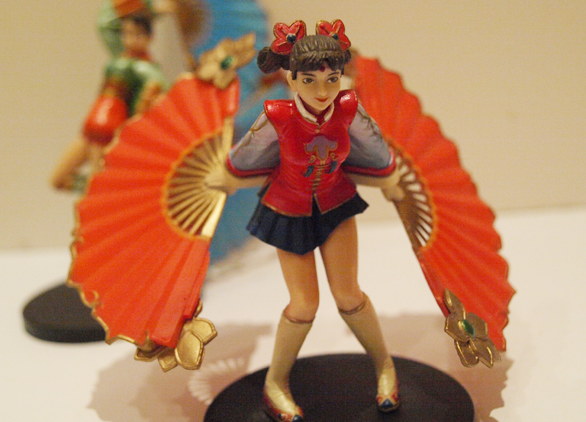 Both of Da Qiaos fans and detachable while as the rest of her body is not, however in Xiao Qiaos case both of her fans,the bow located at the back of her obi, and both of her arms come apart. Taking into concideration that this is a very very small figure, the detailing on the outfit and face is really impressive. 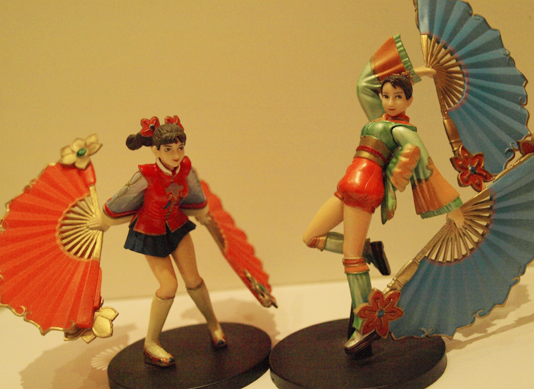 Infact, if you compare a bootleg version of a figure of a larger scale, you can see that even the paint job on Da Qiao is much better. 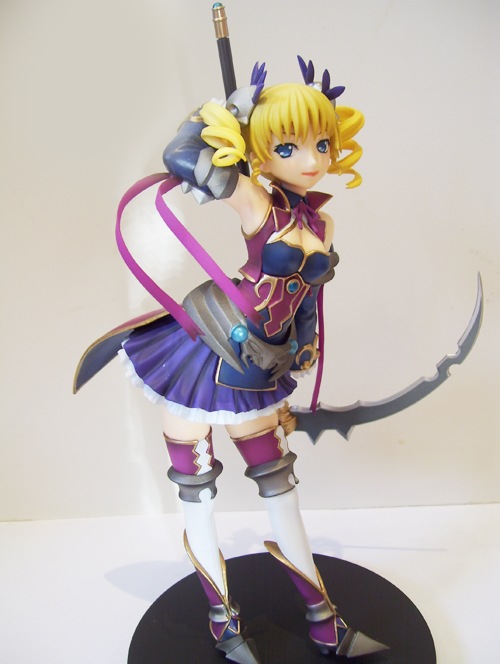 The most impressive part of the figure is the beautiful paint-job and the smoothness of her fans. And now for the little Qiao. The only problem I had with this little one is the fact that she is actually quite difficult to put together believeit or not. I did find howevere that once she is put together she is pretty sturdy and won’t fall apart. The colouring is true to the character, vibrant and eye-catching. 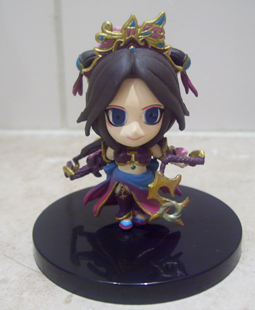 Similar to the Da Qiao version the fans are highly impressive in detail as is her clothing. At the end of the day these figures are only for avid fans of either of the characters or the games which they are from, I doubt a figure collector would find much joy in purchasing these….unless ofcourse your target collection is mini-figures. I myself would pay an unending amount of money for a high wuality large scale version of these ladies! 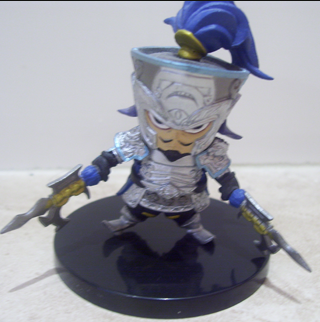 After Dynasty Warriors 6 was released, chibi figurines of a few select characters were also released in two volumes. For those who live in the U.K they were offered as a pre-order bonus on GAME.co.uk of Dynasty Warriors strikeforce (PSP). Zhang Liao was part of Vol 1. and I got him for free when I pre-ordered the game, Diao Chan is part of Vol.2 and I bought her for about £10 on Ebay. These chibi figures are very small, so unless there is chibi of your favourite a character then there’s not much point in getting one. They are very cute, epically ones of pretty tough looking warriors! They are squeee worthy! The detail put into the figures is actually really good considering their small size! Diao Chan particularly very bright and colourful, so if she is one of your top characters, at such a cheap price then I recommend buying it. Isn’t he cute?! (Sorry about the rather crooked image, just my bad photography skills!) I am most impressed by the detailing on his armour! Being so small I would have guessed he would be simply painted grey, but in fact all the indentations are present. His expression is also very nice, just the mix of him looking so tough and angry on a chibi figure is really appealing! 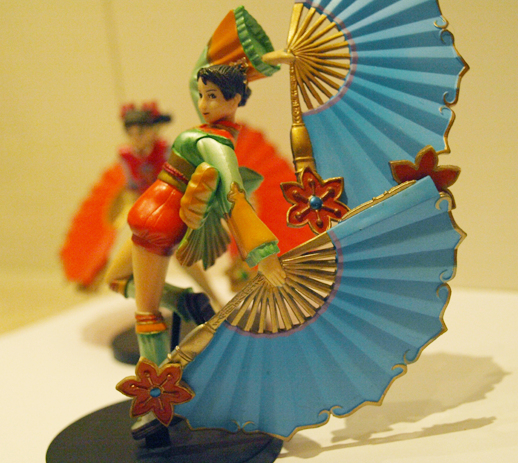 p.s I will be getting the Chibi Kunoichi Figure from Samurai Warriors 3.